I meant to eat chocolate cake for dinner tonight. It was just one of those days. J kindly intervened and made me this instead. It was so good. Salty, creamy, hearty–and it even used up some of our CSA peppers. That man knows what I like. It was perfect for a chocolate-cake-for-dinner kind of night. I did eat chocolate cake before and after, though. Pasta with Smoked Salmon, Cream Cheese, and Peppers: Chop an onion and toss it in your pan with olive oil and a pinch of salt over high heat. Slice a few sweet peppers into strips and add those too. Stir often. 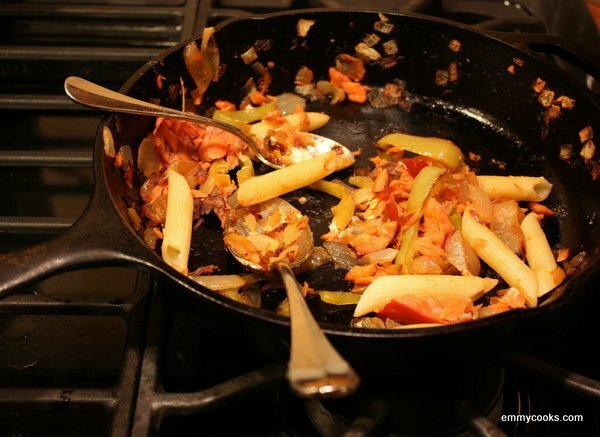 When the vegetables are caramelized and sweet, crumble in a chunk of smoked salmon and add cooked pasta until heated through. Remove from heat, add a few dollops of cream cheese, and serve. This entry was posted in Emmy Cooks Original, Fish, Food, Noodles, Recipes and tagged cheese, onions, pasta, peppers, smoked salmon on October 16, 2012 by emmycooks. You had me at cream cheese :) This sounds so delicious Emmy! Chocolate cake nights are not unusual in our house, nor is smoked salmon, but this pasta recipe adds that elusive warm winter edge.Nice picture of proper food. Oh I’ve had days like that too! We end up having pancakes or cereal for dinner on those nights and I say to myself that it’s more important that we’re all at the table together regardless of what we’re eating! That pasta sounds terrific and is the kind of thing I throw together often…I tend to have goat cheese around more often than cream cheese, but same diff. I can’t wait to try this all my favorite things!!! Thankyou for sharing. Yum, yum, yum, yum! There is this cafe in Prague that makes this smoked salmon in cream sauce pasta that makes me drool like bassett hound. I bet this was amazing! Must. Try. Now! Good man! And Good dish! Double header!